Optimum Oil Therapy Dry Hair Healer | Relaxed. Transitioning. Natural. Beautiful. 42156 SS, Aqua/Water, Paraffinum Liquidum/Mineral Oil, Glycerin, Petrolatum, Cetearyl Alcohol, PEG-100 Stearate, Glyceryl Stearate, Polysorbate 20, Paraffin, Dimethicone, Dicetyl Phosphate, Olea Eurropaea/Olive Fruit Oil, Simmondsia Chinensis/Jojoba Seed Oil, Cocos Nucifera/Coconut Oil, Persea Gratissima/Avocado Oil. Laurdimonium Hydroxypropyl Hydrolyzed Wheat Protein, Sucrose, Parfum/Fragrance, Ceteth-10 Phosphate, Methylparaben, Propylparaben, Triethanolamine, Disodium EDTA, Laureth-23, Butylphenyl Methylpropional, Chlorhexidine Dihydrochloride, Amyl Cinnamal, Hydroxyisohexyl 3-Cyclohexene Carboxaldehyde, Benzyl Salicylate, Limonene, Alpha-Isomethyl Ionone, Citronellol, 2-Oleamido-1, 3-Octadecanediol. Directions: For daily maintenance, apply a small amount into palm, massage evenly into hair, and style as usual. For excessive dryness, section hair and apply directly onto scalp . Comb or brush through hair, and style as usual. After finding Roots of Nature’s Butter Whip Coil Cream and their Feather Whipped Curl Cream at my local dollar store a couple of years ago, I try to keep my eye out for fabulous hair care finds. 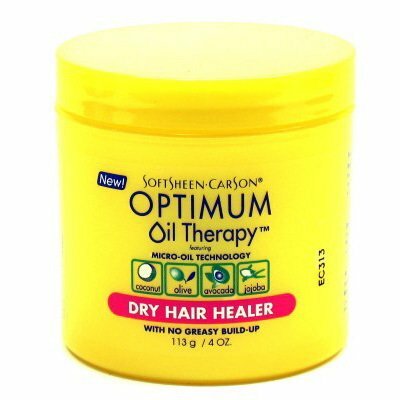 I lucked out, once again, when I found Softsheen Carson’s Optimum Oil Therapy Dry Hair Healer at my dollar store while perusing for craft supplies. I immediately bought four jars. What can I say? I am a sucker for a deal! I’m glad I did. The Dry Hair Healer has a light perfumy scent that I love. It’s fragrant but not obnoxiously so. I also like the light, airy texture of the moisturizer. It is great on dry or wet hair, and kept my strands moisturized in humid weather. (Think 90° – 100°!) If the heat index is just as high, I like to layer some SCurl No Drip Activator underneath to lock-in extra moisture. I lightly spritzed my dry hair with water prior to use and then smoothed the product over my hair. My dry ends vanished right before my eyes! If I use this for a wash ‘n go or to make a high bun, I like to slick down my edges with Elasta QP Glaze. I haven’t tried this with a twist-out yet, but I plan to! I love how this product not only moisturizes my hair but also slightly elongates my curls, which makes my hair less prone to getting tangled. For my relaxed ladies out there, be careful not to apply too much as this product is super-moisturizing. Although, even when I overdid it and added too much product, my hair still didn’t feel sticky or gross like it does when I use other products. Score! According to Softsheen Carson, this product uses what they call Micro-oil Technology to penetrate the hair shaft with micro-beads of coconut, olive, avocado, and jojoba oils. They claim that this dry hair healer will nourish, repair, strengthen, and protect hair with no greasy buildup. I must admit, this product definitely left my hair hydrated (without being greasy). While it’s too early to tell if it prevents split ends, my hair is so moisturized that I’m thinking I may need to go back to my dollar store to see if they have any more left in stock. This little hair care jewel retails between $4 and $6, depending on where you live. But, even when my stash runs out, I won’t mind paying retail! Pingback: My New Hard Water Hair Care Routine | Relaxed. Transitioning. Natural. Beautiful.